I have a hectic week so far, listening to disheartening stories from friends I haven't spoken to in a while, and trying as much as possible to encourage healthy relationships. The biggest question for me this week has been "how do you forgive a person who betrayed you during the honeymoon phase of your relationship?" and I have to say this is one question that made me realize that sometimes forgiveness needs to be defined for different scenarios. These days, loyalty is often thrown back in people's faces. With our fast-paced lifestyle, and the constant need for an ego boost from our peers, we are not seeking loyalty in relationships, and trust is just too drama-free for us. Betrayal is what we believe gives us some kind of power in the relationship because for some funny reason, we believe playing other people for fools make us feel better when we look in the mirror. These days, many of us take loyalty and trust for granted. We believe a partner who is loyal to us is simply too stupid, and should be taught a lesson. So we go out of our way to play that person for a fool. I've spent days pondering this topic, and I've come to one conclusion: this is a generation filled with people whose self-esteem is directly proportional to how other people perceive them. We draw our confidence from what people say about us, so if they are not praising our faithfulness in relationships, we feel we are playing dumb unnecessarily and ought to 'impress' these people by hurting someone who chose to trust us. I was once in a relationship with a guy whose friend kept telling him relationships are not worth the trouble, and I'm outsmarting him by making him fall in love with me. What did he do in response? He cheated and made it clear to me that men are meant to cheat because they can't help it. I beg to differ! If you cannot be loyal or if you are the type to take a person's trust in you for granted, stay single! 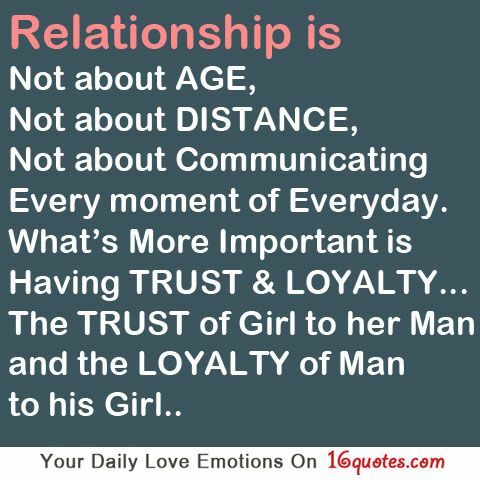 It hurts both males and females if trust is betrayed or loyalty is taken for granted. And as much as I preach forgiveness, I can hardly ask a lady or a guy to return to a person who has cheated during the honeymoon phase of your relationship. In my opinion, I believe a person who cheats during that phase was never really into you from the start, and you will always come off as second best.